Ever wonder how great digital reporting would be if the whole thing was automated? Just imagine how much time you’d be saving, and how much money you’d have left in your pocket if you had an automated dashboard report with all your KPIs! Well, wonder no more, for DashThis allows you to bring all your marketing data in the same awesome report, automatically and easily. Goodbye excel, time for dashboard reporting! Enough already with the data copying and pasting! Creating your dashboard report should never have to be a tedious task. In fact, why not let the whole thing take care of itself so you can focus on growing your business instead? Our dashboard reporting tool lets you see all your data the way you want, without the painful “do it yourself” part. Let’s face it; we’re all human, and humans make mistakes. Since we understand the importance of the dashboard report you generate, we know you wouldn’t want to risk messing one up because you made a small copy-pasting error. Automating your dashboard report ensures you don’t find yourself in such a situation. 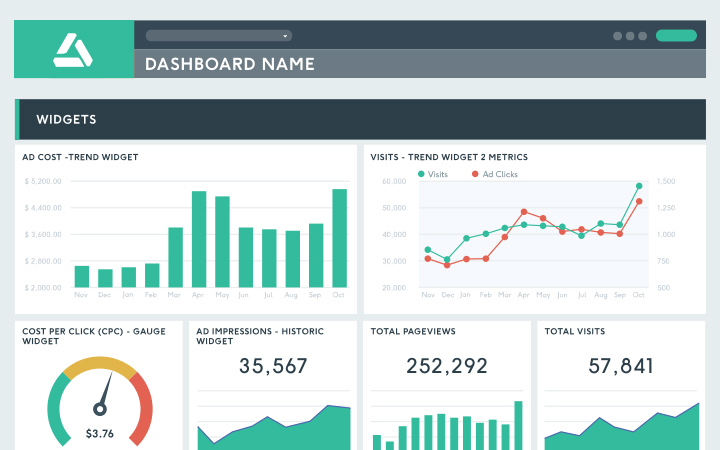 Create dashboards that shows off your brand’s personality with our dashboard reporting tool. From adding a logo or comments, to merging widgets, to adding your own KPIs, to creating your own template from scratch, almost everything about your dashboard report can be customized. Google Analytics, Google Ads, Facebook, Twitter... bring all your marketing tools together in your dashboard report and keep track of your data easily. Need to add your own custom data? You can also import your CSV files and set it up so it’s automatically updated every month. Keeping track of all your KPIs has never been easier! It all sounds a bit too good to be true? You don’t need to take our word for it. Many other agencies have taken their dashboard reporting to the next level by using DashThis’ reporting dashboard, and they have nothing but praise for both our software and our exceptional customer service. See for yourself here. Our team is fully dedicated to making your user experience as smooth as possible, and that’s why we came up with a tool with so many easy-to-use features. You’ll create your dashboard report in no time with preset widgets, report templates, all the integrations you need, as well as your own dedicated account manager. How much time do you think you’re gonna save by using DashThis? Every minute your employees spend on manually building a dashboard report is a minute they’ll now be able to spend helping you grow your business, while we take care of the dashboard reporting part of things. Sounds like a deal, uh? Replace the standard DashThis dashboard report URL with one branded to your company (dashboard.yourcompany.com maybe?). Let us create custom reporting dashboards for you with a white label design that reflects your client’s brand’s colours, fonts, and overall vibe. Save on a custom URL and design with a white label bundle that includes both! A reporting dashboard just the way you want it! Check out our Google Analytics report template ! Your clients’ websites undoubtedly involve a whole lot of data you need to constantly keep track of. With a Google Analytics report template, gather all your clients’ website data in a single, nice-looking Google Analytics dashboard report and start reporting in no time! Read our blog for more reporting dashboard related content!